In 1989, Lars-Åke (Lars to his English speaking friends), created Idsjöströmmen, Scandinavia's first catch-and-release river. For his efforts to restore and protect this section of the Gim River in northern Sweden he received the 1992 FFF Conservation Award. He continues to watch over Idsjöströmmen as a riverkeeper each year between May and September. 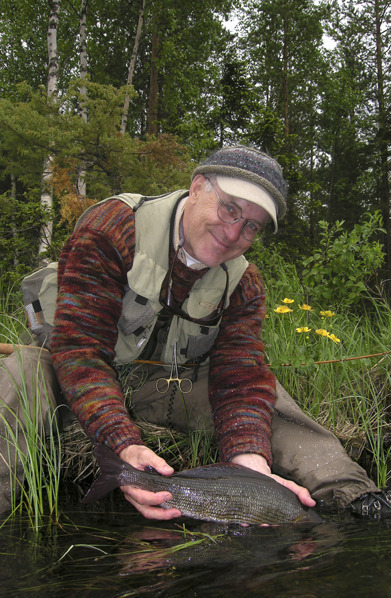 As an author, Lars has written five books about fly fishing: Flugfiske i Fjällen, Ur Min Flugask, Gimåflugorna, Flugfiskeströmmar, Flugfiskets Mästare plus numerous articles for Swedish and international fishing magazines. He has also been featured in three DVDs and one DVD in English. His writing has also appeared in the anthologies: The World's Best Trout Flies, The Grayling, and Dream Fishing. A featured guest and fly tyer at international trade shows, Lars has also held numerous fly casting and fly fishing schools throughout Europe and the US. He has appeared several times as a featured guest on Swedish National TV and was profiled with Jennifer on PBS's Western States Fly-Fishing Journal. Jennifer, a former fly casting instructor and licensed Montana and Yellowstone Park fishing guide, is author of, Fly Fishing the River of Second Chances: Life, Love, and a River in Sweden. Her first book was, Cast Again: Tales of a Fly-Fishing Guide. She has held numerous casting clinics and fly fishing seminars throughout the United States and in Scandinavia. Jennifer was the first woman to be endorsed by the Scott Fly Rod Company, and has been a guest speaker at national and international trade shows. She has appeared on CBS This Morning, Fishing the West, ESPN’s - On the Fly, and on Swedish National Television. Recently she appeared on ESPN's, FLY FISHING CHALLENGE, as a member of Team Simms.